Texas Instruments Asia introduced in January 2012 with this amazing TI-84 Plus Pocket SE a graphing calculator very similar to the TI-84 Pocket.fr sold in France since Summer 2011. And what is so amazing with the TI-84 Plus Pocket SE? Just the size, it packs the specifications of the original TI-84 Plus Silver Edition into a much smaller footprint. 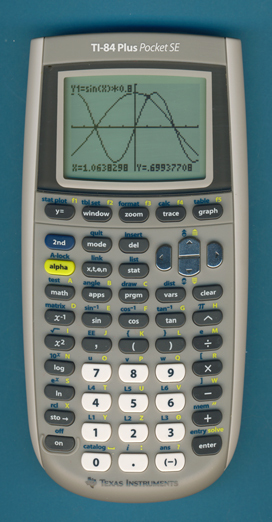 This TI-84 Plus Pocket SE manufactured in November 2011 makes use of one Macronix Flash-ROM with 2M Byte capacity. The driver circuit of the LC-Display was traditionally manufactured by Toshiba for Texas Instruments' graphing calculators. This TI-84 Plus Pocket SE manufactured in 2011 shows with the Novatek NT7564H a one-by-one replacement. It is just a bare chip mounted on a flexible piece of circuit board attached between the display and the main PCB. The TI-84 Plus Pocket SE is permitted (as of November 2, 2011) for use on SAT, ACT, PSAT and AP exams. © Joerg Woerner, May 30, 2015. No reprints without written permission.